On Friday night, most of the New York opera fanatics I know were at Peter Grimes at Carnegie Hall. Forgive me, but I enjoy Strauss far more than Britten and I went to Der Rosenkavalier instead, in its first performance at the Met this season. It’s an adequate but uneven revival, featuring a promising surprise debut by Erin Morley as Sophie but some miscasting elsewhere. The biggest drag on the evening was Edward Gardner’s conducting, though drag isn’t really the right word. Because it was quite rushed, heavy, and thick, which is a bad combination for Strauss. There was little gradation of texture (particularly noticeable considering Vladimir Jurowski’s exemplary transparency in the Met’s current Die Frau ohne Schatten), and the orchestra was consistently too loud, often forcing the singers to belt when they probably were perfectly capable of doing something more subtle. Gardner seems to have little sense of Strauss’s rhythmic flow, either, and while fast, his conducting rarely danced, and when he slowed down (as he did for much of the solo music), it was just slower, without the sense of lingering on a thought. I wondered if he was shy of making it too sugary, but it didn’t seem like he’d found a plausible alternative. The orchestra played fairly cleanly, with a few clams in the horns and trumpets, but I missed the string sound of Munich and Vienna. If Vienna was lacking in the strings, it was present in Martina Serafin’s regal Marschallin. She gave a classy, solid performance with beautifully clear diction and sense of the text. She’s sympathetic and natural onstage, and gives a good impression of spontaneity. Her voice is big enough to have won most of its fights with the orchestra, and it has an appealingly old-school grainy quality. But this was also a modest performance, lacking in some degree of magnetism. While the Marschallin might give up Octavian, she still is the most complex figure in the opera and often has the greatest command of the stage; Serafin seemed to have resigned that role as well. The only thing big about her Act 3 entrance was her dress. Perhaps this was because the revival was planned around Elina Garanca’s Octavian, which is reputedly just such a major performance. But Garanca is pregnant, and was replaced here by Alice Coote. While I really like Coote, she is thoroughly miscast and we are left with something of a stardom lacuna. Coote’s solid, thick voice lacks the complex overtones and sheen that this role ideally demands, and its near-soprano range seems high for her. It also seems to be a bad match for her introverted, non-showy personality. She did best in Act 3, where her piping, shrill Mariandel had some funny moments. But in the straightforward ardor of Act 1 and the majesty of Act 2 she seemed out of her element. The trio was completed by Erin Morley, a happy replacement for the “sick” Mojca Erdmann. Morley has been singing small roles at the Met for a while—things like Rhinemaidens and the Dew Fairy—as well as larger roles elsewhere. Her Sophie started off irrepressibly energetic, and her voice is a lovely high soprano, very well focused and controlled even in the highest reaches. She understandably spent a lot of the opera looking directly at Gardner, but this was an impressive role debut and I hope the Met gives her more good assignments. There must not be too many Barons Ochs (Ochsen?) in the world of opera, because I’ve seen Peter Rose sing this thing a number of times in any number of very similar productions. His voice isn’t the largest, which was an issue here, and he had real trouble with the highest and lowest parts (the top note on the haystack line being a particular issue), but he certainly knows his way around the opera, gets the dialect, and can play the comedy without being as irritatingly crass as some. The supporting cast was acceptable if not distinguished, with a pinched and high-note-challenged Italian Singer from Eric Cutler, an uneven but really funny Annina by Jane Henschel, a largely inaudible Valzacchi by Wolfgang Ablinger-Sperrhacke, an unmemorable Faninal by Hans-Joachim Ketelsen, and a very shrill Marianne Leitmetzerin by Jennifer Check. As the Police Commissioner, Richard Bernstein did his usual thing of singing everyone else off the stage and making you wonder why he wasn’t singing Ochs or Faninal (he is doing the same as Zaretski in Onegin). Only James Courtney, as the Notary, was guilty of heinous overacting. Given such a variety of elements, a truly successful “Rosenkavalier” could emerge from only two sources: a powerful integrated dramatic supervision, or an overwhelmingly influential effort by the conductor. This “Rosenkavalier” was not blessed with either. Nathaniel Merrill’s direction solved, successfully, the primary problems of movement, displacement, and interchange of personnel on and off stage. But he had not, so far as I could determine, done much to stimulate characterization among those performers who had not brought a characterization with them, or achieve a totality among the characterizations that were offered. I could not have put it better myself. He also notes, “Best of all, the [set designer] O’Hearn production gives every promise of durability.” Perhaps that virtue has carried this one a little further than it should have? Let me say that my companion at this performance, who knew the score but had never seen the opera live, found it fairly satisfying. This is an opera impressive and multifaceted enough that any halfway decent performance offers considerable food for thought. (I catch something new every time, and I still regularly miss the point in Act 2 when Annina and Valzacchi switch sides.) But as an admitted Rosenkavalier addict (in my defense, I spent 2010, which was its 100th anniversary, in Austria and Germany, when everyone was producing it), this one is middle of the pack at best. 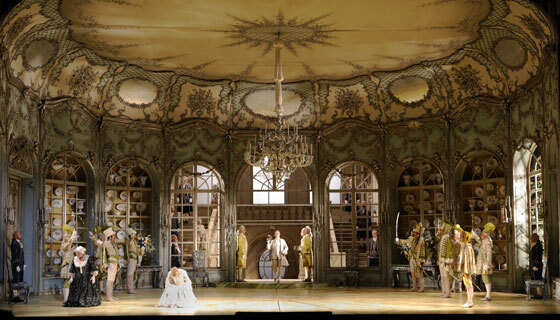 Der Rosenkavalier runs through December 13. Photo copyright Jonathan Tichler. Strauss-Hofmannsthal, Der Rosenkavalier. Met Opera, 11/22/13. Production by Nathaniel Merrill (revival), conducted by Edward Gardner with Martina Serafin (Marschallin), Alice Coote (Octavian), Peter Rose (Ochs), Erin Morley (Sophie), etc., etc., etc. While Otto Schenk’s Wiener Staatsoper Der Rosenkavalier have been spiffed up and the staging is showing alarming signs of rehearsal, a great Rosenkavalier still requires a great cast. While Adrianne Pieczonka’s Marschallin is very fine, neither she nor her less distinguished costars quite lit up the stage. With the exception of the excellent orchestra, this wouldn’t have rated above a solidly routine Rosenkavalier in most houses. In Vienna, a city that takes its Rosenkavalier almost as seriously as its Mozart, it ranks as a disappointment. 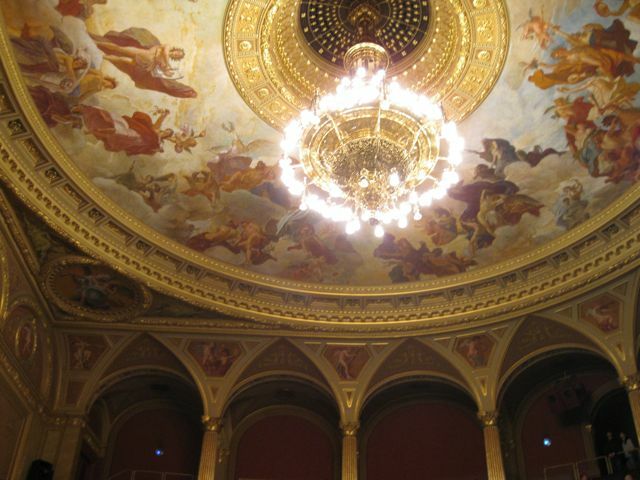 Budapest’s magnificently gilded opera house is a relic from Hungary’s glory days, when the city was the joint seat of the Austro-Hungarian Empire. But while it was a high point for a nation that considers itself very important (just check out the size of the Hungarian Parliament), the Dual Empire period was the beginning of the end for Habsburg power. 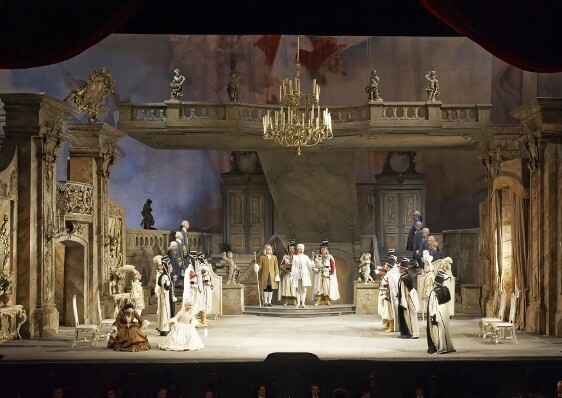 On the cusp of World War I, Strauss and Hofmannsthal’s Der Rosenkavalier would appear, a Habsburgian comedy in the same rococo guise as some parts of the opera house. Rosenkavalier in Budapest, you might say, has baggage.